Despite all the great work call centres play in our community, unfortunately, there are still call centres around the world that give the industry a bad name. Especially when they are used to conduct illegal activity like the infected computer scam phone calls. We first reported this scam in 2014 and sadly, it appears as though the infected computer scam is still well and truly alive in 2018. In fact, according to the Australian Competition and Consumer Commission (ACCC) there has been a significant spike in this type of scam with 8,000 reports recorded in 2018 so far with losses totalling over $4.4 million. Ouch. So what is the Infected Computer scam? Scammers will contact you over the phone while they impersonate a well-known company, most commonly Telstra, NBN or Microsoft and craft a very credible and believable story about something being wrong with your computer. Whatever the reason they give you, the key objective for the scammers is to get access to your computer. Once they are in, they can either upload a virus or steal personal information such as banking details, files etc. Short of not answering your phone, there is very little you can do to avoid getting the call in the first place. Even placing your number on the Do Not Call Register or even having a silent number does not prevent you from getting any type of scam calls. So given there is no actual way of stopping the calls, according to ScamWatch the best thing is to just not disclose any information in any circumstance. 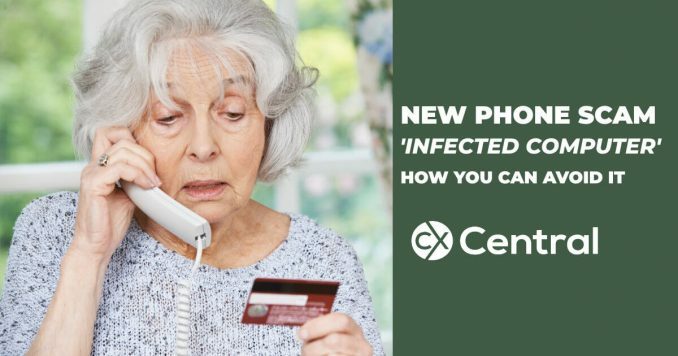 We hope by raising awareness we can prevent people from being scammed however if you have found yourself a victim of the infected computer scam (or any others), there is some help available. Please refer immediately to the Scamwatch website where they have a handy guide on where you can get help depending on the type of scam involved. We’ve also got a handy guide on How to stop Telemarketing calls providing you with tips and information on how to stop telemarketing calls.